Building 771-773, Monivong Blvd.Khan Chamcarmon, Phnom Penh. Cambodia is located in South-East Asia, with a total area of 181,035 sq km lying north of the equator and next to Vietnam, Thailand, Laos and Gulf of Siam. The population is approximately 15 million, with an annual population growth rate of about 1.6%. Cambodia was colonized by the French from 1863 to 1954. After independence, the country had peace until 1970 when Cambodia entered many years of war. Between1970-75, the country suffered civil war and international invasion, and the Khmer Rouge came to power. The Khmer Rouge regime, in addition to killing an estimated two million people, brought about one of the major population displacements of human history, forcing hundreds of thousands to move from cities and towns to the countryside and from one part of the country to the other. In 1978 Cambodians who opposed the Khmer Rouge regime, supported by the Vietnamese army, attacked the Khmer Rouge, liberating Phnom Penh on 7 January 1979. It was not until 1998 that all Khmer Rouge forces stopped fighting in all parts of the country. Beginning in 1979 the country was reconstructed from scratch. The whole territory of Cambodia contains 25 provinces/municipalities with a total of 197 districts, 1633 communes and 14,138 villages. The history of modern land management and administration in Cambodia begins with French initiatives in the late 19th century. The first Civil Code was adopted in 1920 and it established a system of French land law that recognized private property rights. Some traditional Cambodian rights, in particular that of creating a land right simply by occupation and possession, were included in the Civil Code. During the 1960s there was an adequate system of land management, including confirmation of private property rights with land records including cadastral maps and land titles. The land management system started deteriorating during the war period 1970-1975. Thereafter under the Pol Pot regime (1975-1979), not only were private property rights completely destroyed but all cadastral records, including cadastral maps and titles, were destroyed. The professionals in land law, land management, registration and surveying were either re-deployed to the countryside, left the country or were executed. Starting in 1979 the State of Cambodia organized collectives as a basis of claiming user rights to agricultural land: residential use rights were allocated on the basis of occupation while ownership of all land remained in the hands of the state. In 1989 the government re-introduced private property rights, with ownership rights granted for residential land of a size up to 2000 sq. meters, possession rights for cultivated lands less than 5 ha, and concession rights for plantation land greater than 5 ha. According to a new land law adopted in 2001, ownership titles can be issued for many types of private uses in addition to residential. In 2011 Cambodia enacted a new Civil Code, which cancelled or modified some provisions of the 2001 land law, but left intact the basic legal regime described above. Many land issues in Cambodia are the competence of the Ministry of Land Management, Urban Planning and Construction (MLMUPC), which has a wide mandate through five General Departments: General Department of Land Management and Urban Planning, General Department of Construction, General Department of Cadastre and Geography (GDCG), General Department of Administration, and General Department of Housing. The GDCG is responsible for land registration and land administration, geodetic and cadastral surveying, mapping and property valuation. The 197 District and 25 Provincial/Municipal offices of the MLMUPC carry out actual implementation of land registration, administration of land transactions, and land use planning. Up to now there is no private sector in land registration and cadastral surveying. The Government is still discussing specific requirements to introduce a qualification system for surveyors through a draft law on Surveying and Mapping. There is no professional association for cadastral surveyors yet, but at the moment there is the Board of Engineers Cambodia (BEC), derived from The Engineering Institution of Cambodia (EIC) has a committee on Topographical Survey and Cadastre, which has about 20 members. In the draft sub-decree on the Management of Surveying, Mapping activities and Service, Surveyors and surveying firms registered by the MLMUPC may form a surveyor’s association. The MLMUPC shall provide assistance in the organization and establishment of such association. The Ministry of Land Management, Urban Planning and Construction is affiliate member of FIG since 2002. Currently, there is no licensing system in place for cadastral surveying professionals working in the cadastral system. The Ministry of Land Management, Urban Planning and Construction has drafted a sub-decree on the Management of Surveying, Mapping activities and Service to provide the legal basis for the private sector profession with the goal that most or all land surveys will be done by private sector. Between1992-1997 the Land Titles Department (LTD) (later absorbed into the MLMUPC) oversaw a diploma degree on cadastre at the Prek Leap Agricultural College. In those years, systematic in-house training in the LTD took place continuously. In 2002, the Land Management and Administration Faculty was established in the Royal Agriculture University in Phnom Penh, with the support of the Land Management and Administration Project (LMAP), which was based in MLMUPC. The support covered curriculum development, a professor exchange program, constructing a building, providing furniture and office equipment and equipment to use to train students in surveying and land management. The Faculty established two degrees: a bachelor degree of four years and a diploma degree of two years. LMAP was later discontinued but MLMUPC support to the faculty continues. The cadastral system in Cambodia is designed to provide legal ownership of land. The cadastral system also supports the transfer of land ownership in a formal land market and supports land administration activities as well. In Cambodia, there is only one cadastral system—a title registration system—for the whole country. The Cambodian cadastral system supports legal land parcel identification of public and private lands. There are problems with illegal settlements on state land such as on road corridors, waterways, national parks, forests etc. 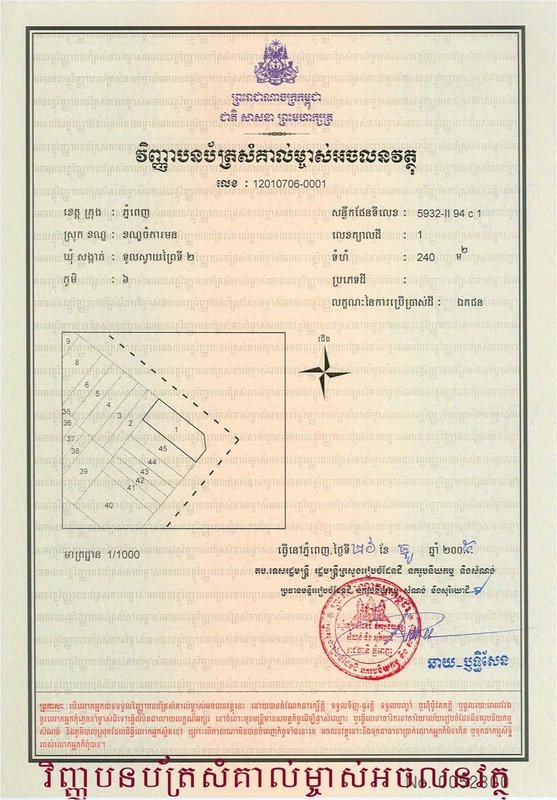 The cadastral system in Cambodia is operated by the district offices of the Ministry of Land Management, Urban Planning and Construction and operated in such a way that land parcels are surveyed and adjudicated (investigated) in the field and then corresponding land ownership titles are recorded in the land registry. The land registry is kept and maintained at three levels: national (General Department of Cadastre and Geography), provincial and district. The smallest unit in the land registry is the land parcel. A land parcel or cadastral unit is a specified land area that is situated within a single commune or sangkat ,that is not divided by a joint, indivisible boundary, that belongs to one person or several persons having an undivided ownership, and that is used in a single manner. There are numerous legal texts that have been adopted to support the cadastral system such as sub-decrees on systematic land registration, sporadic land registration, the Cadastral Commissions and so on. Textual Component – The land register shows, according to each parcel number of ownership, the names of owners and the means of identification of such land parcels, the description of the ownership, the size of the land parcel, the easements and other charges that encumber it and the history of the parcel. Spatial Component – Cadastral index maps show all land parcels graphically corresponding to the registered parcels with unique identifiers. The cadastral index maps exist only for the areas where systematic land registration has been implemented. Out of the estimated 7 million parcels in Cambodia, the cadastre covers approximately 4 million (both sporadically and systematically registered land) including privately owned land, Indigenous communal land and state land. 620,000 parcels have been registered since 1990 through sporadic registration and 3.4M have been registered since 2000 through systematic registration. At present day the cadastral index map covers only the systematic land registration areas. Digital orthophoto mapping is facilitating the elaboration of cadastral index map. Figure 2: Example of a cadastral index map (overview). 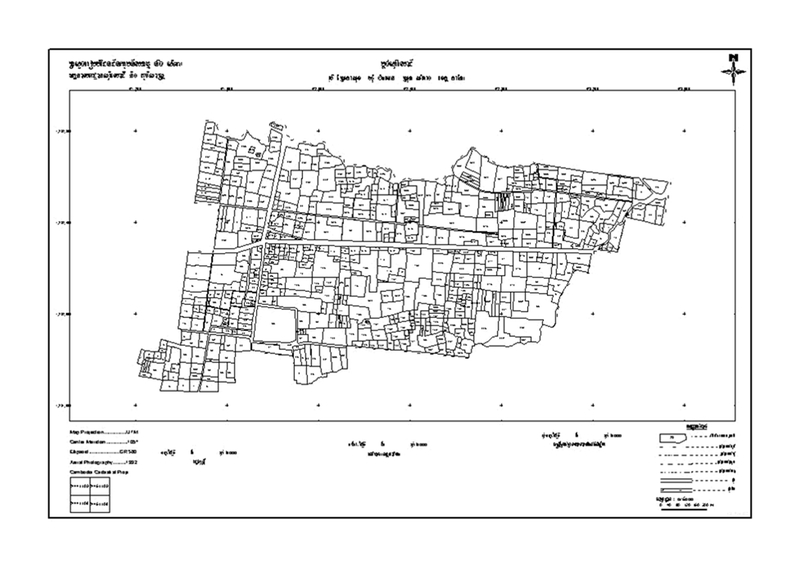 Figure 3: Example of a cadastral index map (detail). Spatial Data Infrastructure (SDI) still has to be developed for Cambodia by the MLMUPC. There are two main reform issues, concerning de-concentration and land dispute resolution. Starting in 2002 the MLMUPC has delegated the power to all 25 provincial/municipal offices to issue land titles. There is also a mechanism for out-of-court land dispute resolution through the Cadastral Commissions. The Land Administration Sub Sector Program to register 400,000 land parcels/year.